ZIMBABWE (ANS) — Barnabas Aid’s regional coordinator on the ground in Zimbabwe relayed shocking scenes of “total and utter devastation” as Cyclone Idai smashed into the coast of Mozambique last Friday (March 15, 2019). 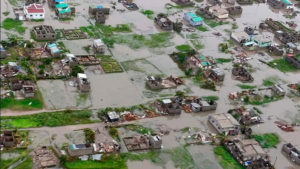 The weather system had been building and moving across south-east Africa for over a week, causing floods and destruction in Mozambique, Malawi and Zimbabwe. At least 2.6 million people have been affected. According to the UN it could be the southern hemisphere’s worst ever disaster. In Mozambique, an estimated 1.7 million people were in the path of the cyclone, and at least 1,000 have died. The port city of Beira, Mozambique was the hardest hit with more than 1,000+ feared dead and many missing. In Malawi, where HIV has 280 Support Groups, 56 people have died and people “are now facing a second threat of flash floods” following the cyclone, according to the International Federation of Red Cross and Red Crescent Societies on Twitter.